This pigeon hole style shelving unit is a great look for a rustic hallway, office or study. House shaped design that adds some rustic charm. 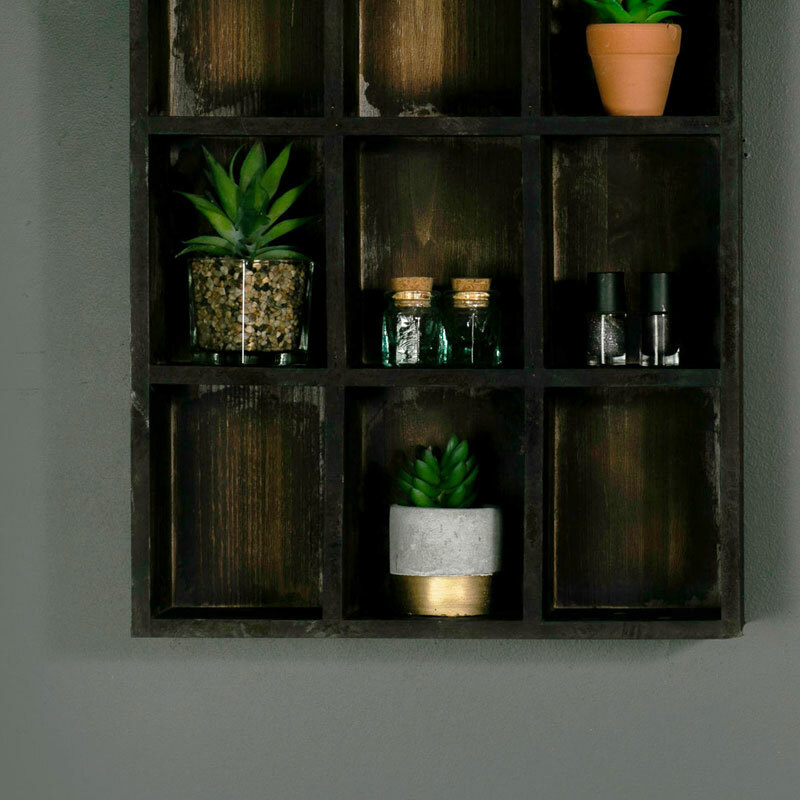 Made from wood and stained in a dark brown to give a woody, rustic appearance, the unit features 9 pigeon hole style shelves with a further space underneath the eaves. Use for a practical storage purpose of for displaying ornaments or small plants. In a wall mounted design that can also be used freestanding when placed on a shelf or console table. This pigeon hole style shelving unit is a great look for a rustic hallway, office or study. House shaped design that adds some rustic charm. 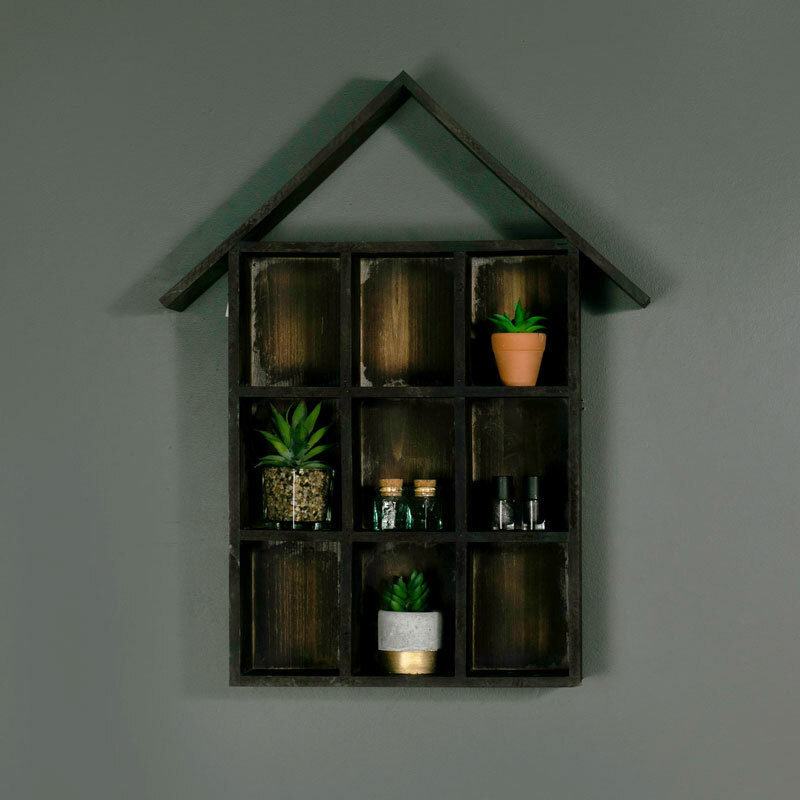 Made from wood and stained in a dark brown to give a woody, rustic appearance, the unit features 9 pigeon hole style shelves with a further space underneath the eaves. Use for a practical storage purpose of for displaying ornaments or small plants. In a wall mounted design that can also be used freestanding when placed on a shelf or console table. Made from wood and stained in a dark rustic brown colour. The shelf unit is easily wall mounted with 2 d-ring hooks on the back. This wall unit is a fantastic addition to our range of rustic, retro and industrial furniture and home accessories. Great style that can be mixed and matched to suit every individual taste and decor.